An average test score is the sum of all the scores on an assessment divided by the number of test-takers. For example, if three students took a test and received scores of 69, 87, and 92, these numbers would be added together and then divided by three to get an average of 82.6. Public schools rely on average, below average or above average test scores to identify how well a group of students learns. In some cases, students may be compared to their peers in the school district, county or state. With the rollout of the Common Core State Standards, which established a common set of academic guidelines for states across the country, students may more frequently be compared to their peers nationally. But other times, school officials distinguish average students from others to see who's on grade level or how well an individual child performs in school compared to classmates on nationally normed tests. What Does Average Mean in Special Ed Testing? In special education, average test scores are particularly useful in standardized evaluations and in tests designed by teachers. Educators determine the average by adding a set of numbers and dividing the sum by the total number of numerals used in calculating that sum. Anyone who's been graded on a curve likely knows the concept well. Teachers and specialists can use averages to determine the "middle" group of test-takers. Statistically, about 68 percent of any large group of students will score within the low average to high average range on most tests. (The other 42 percent will be in either the above average or below average group.) The exact average score itself defines the 50th percentile. So how do educators proceed once they've identified the average? Teachers and specialists may use averages to monitor the rate at which the class is learning the material. Teachers also use averages to estimate where an individual student's scores place in relation to the rest of the class. This is especially important for students with learning disabilities. Educators may also use averages to measure how an individual students' abilities rate on tests used to diagnose learning disabilities. Sometimes educators and analysts use other terms for the word "average." Rather than say "average," they refer to the mean or the 50th percentile. You might have learned about these terms in math class. They may be used interchangeably with the term "average." Want an example of an average? See if you can figure out the mean test score with the following information. Suppose six students scored 72, 75, 78, 82, 84, and 92 on a test. To calculate the average, add the test scores together and divide the sum (483) by six. The average score would be 80.5. Anyone with basic math skills can determine an average. If your child scores below average on a standardized test, don't panic. A number of factors could have produced this result. As you've likely heard for many years, eating well and getting a good night' sleep before a standardized test is done can influence scores. If your child is struggling emotionally in any way, this can be a factor as well. 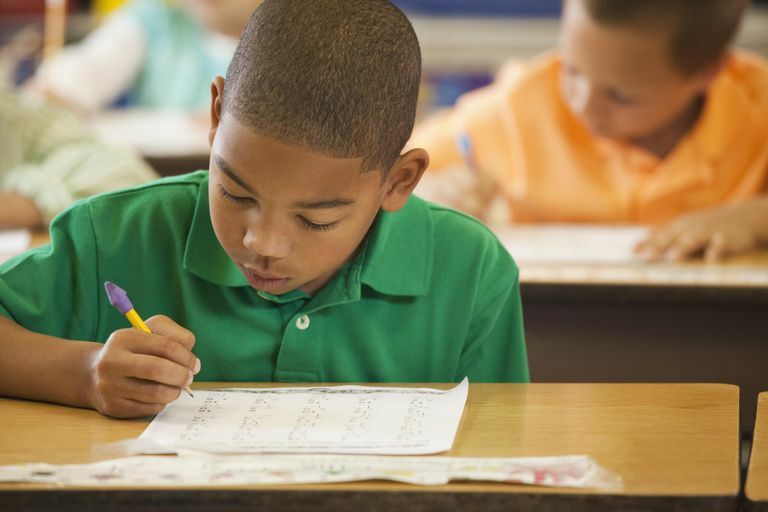 Some children are very bright but have test anxiety, making these tests an inaccurate measure. If you are concerned this may be a problem talk to your child's teacher. There are a number of ways in which you may able to get around test anxiety so that your child's scores truly reflect her understanding of the content of the test. If your child is struggling, you may need to understand more about test scores. For example, teachers use what is known as standard deviation to describe students who fall outside of the 68 percent of scores which are described as below average, average, and above average. If your child performs below average on a test you find out that your child has learning difficulties in a subject area, it's important to get the child the help needed. Early intervention can prevent your child's struggles from worsening. You may wish to begin by talking to your child's teachers or the school psychologist. If you don't understand what is being said about test scores, ask questions. You are your child's greatest advocate and it's important for you to understand both what your child's teachers are saying, and any plan you devise to help your child succeed. National Center for Education Statistics. Children and Youth with Disabilities. Who is Responsible for Private School Tuition for Special Ed Students?